1. Government job Applications are invited form the eligible persons for filling 242 vacancies of Multi-Tasking Staff (MTS) of the Divisions/ Units in West Bengal Postal Circle. 2. 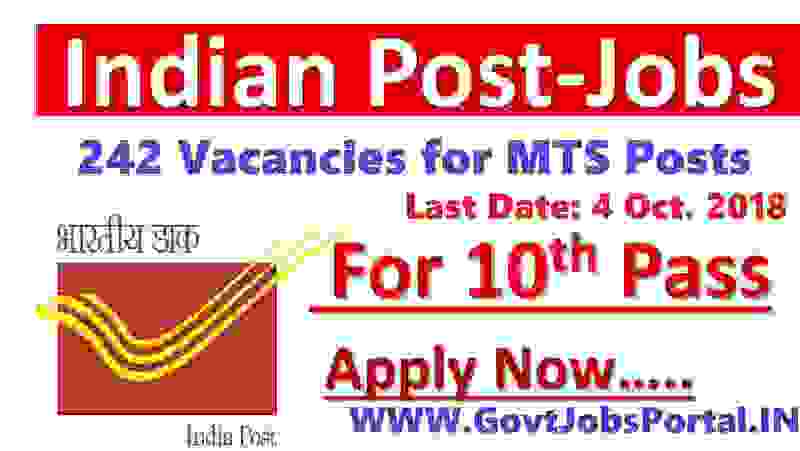 The details of category-wise vacancies in each cadre in each of the Postal Division / Unit are furnished in “Vacancy Statement” stating division wise vacancies of MTS. 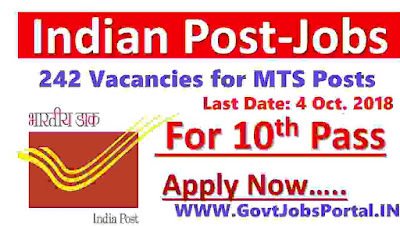 More information related to this India Postal department recruitment for Multi-Tasking posts is given below in this article. Read it carefully before applying online for these Government jobs under India Post. Pay Band: Pay Matrix-1 (Rs. 18000-29700) + other allowances. Educational Criteria: (1) Indian candidates who passed in their 10th standard from a recognized Board or University of India can apply for these Government jobs in India Post Department. (2) Applicant must have the Knowledge of local language of the West Bengal/Andaman & Nicobar/Sikkim State as the case may be. Age Criteria: All those applicants are eligible whose age lies in between 18 years to 25 years. a) Examination will be conducted for 120 Minutes covering four parts(GK, English, Maths & Local Language) in a session. b) Each section of the paper will be for 25 marks so the four parts marks will be = 25 x 4=100 marks. · For the male applicants in General and OBC categories: Rs. 400/-. All Indian Applicant has the access of the official website of the deprtment, the link of website is: “http://cpmgwbrecruit.in/recmtssep18” for seeing the detailed Notification/Advertisement issued by the Department and the Guideline / Information Brochure. (ii) We personally advise all the applicants who are going to apply online through the website, the Candidate must read the detailed notification, Guideline/Important Information carefully which we share in this article as well as in the official notification. · The soft copies of passport size photo (Max 50 kb, Min 20 kb, .JPG format). These two document is required while you filling up the online application. (iv) Must note that one applicants have to submit one application. If department found more than one application for a single candidate the application form will be rejected. (v) Fill up the online application form with your detail and upload the all document online and CLICK on the SUBMIT button. Before clicking on the Submit Button please cross check all your information is correct or not. Because once you Submit the application you will not able to make changes in the application form. 4TH Oct. 2018 is the Last Date to apply.